Are you looking for the safest and easiest way to store your home made baby food? Take the same care with storing your baby food as you take with making it. These high quality glass jars and lids from Jervis & George are made especially for busy moms and dads. Why choose Jervis & George baby storage jars? Safety is our priority and this is why we regularly perform external safety tests on our products to ensure they are 100% safe for our little ones. No nasty toxins can creep into our products! At J&G we are all about sustainable, innovative and safe products for our children. We want to ensure our children are eating from quality natural materials that are safer for them and our planet. - Each 4oz & 8oz jar has measurement markings in oz and ml allowing you exact control over portioning. - Each storage set comes with a non-toxic, wet erase marker. This means you can write the contents, and date, on each lid. The ink won't smudge and can be easily removed with a damp cloth. - The jars are designed to go into the freezer, the microwave or the top shelf of the dishwasher. - Most importantly each jar and lid are 100% BPA, phthalate and PVC free making them safe for your baby. As well as being easier to clean than plastic, glass is safer as its non-porous surface doesn't absorb food and germs. The glossy surface of glass repels food odours and residual flavors which not only makes it safer but also makes the food taste fresher and fuller. Buy our baby food storage set completely risk free and if you don't love it for any reason then it can be returned for a full refund. 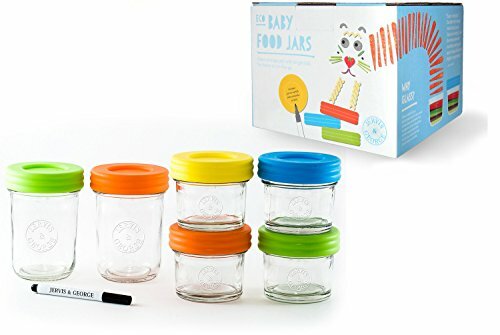 CONVENIENT: Portion, store, freeze, heat and serve your homemade baby food with ease in these high quality glass jars. Set contains 4 x 4oz jars and 2 x 8oz jars. NO MESS LIDS: Screw on lids come with a silicone seal to ensure they are airtight, watertight and leakproof to prevent spills and keep food fresh for longer. MARKINGS: Each jar has easy to read measurement markings and each set contains a non-toxic wet erase marker pen allowing you to write the contents of each jar on the lid. WHY J&G: We are all about our little ones food being stored and served from safe, non-absorbent materials which are innovative & ECO friendly. Our products complete safety tests to ensure they are 100% safe and have no nasty toxins. We also offer a lifetime guarantee - if you don't like our products then simply return them for a full refund. View More In Food Storage & Organization Sets.